How Does Garlic Work For Sinus Infection? 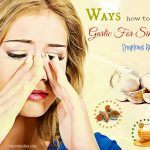 How To Use Garlic For Sinus Infection Relief? It is estimated that approximately about 35 million Americans suffer from sinusitis or a sinus infection annually . Sinus infection is a swelling, inflammation of the tissue that lines the sinuses, resulting in an infection. Sometimes, it causes pain and mucus build-up. Once you suffer from a sinus infection, you will know how unpleasant it could be. It is even worse than a stuffy nose. According to estimation, sinusitis is the 5th most common medical diagnosis that antibiotics are prescribed for in the United States . Whilst antibiotics for a sinus infection are a common conventional treatment, most sinus infections are the result of viruses or colds. Thus, they will become better when your nasal congestion improves . Fortunately, there are many natural ways to handle a sinus infection, such as the foods you add and don’t add to your diet, essential oils, saline nasal sprays, and natural ingredients around home. 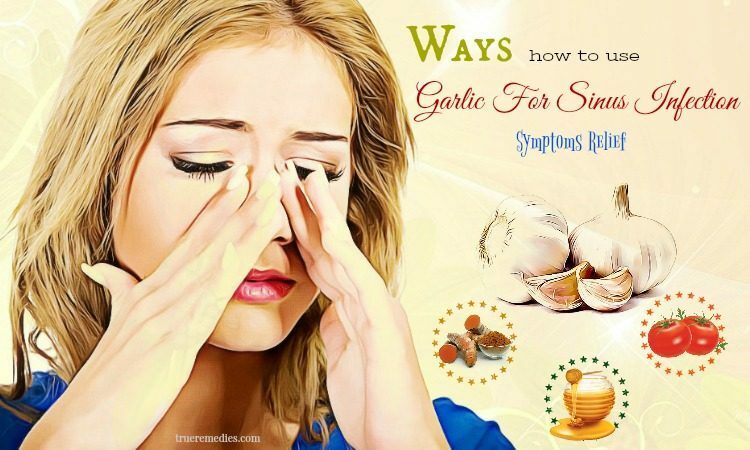 This article will focus on using garlic for sinus infection relief. 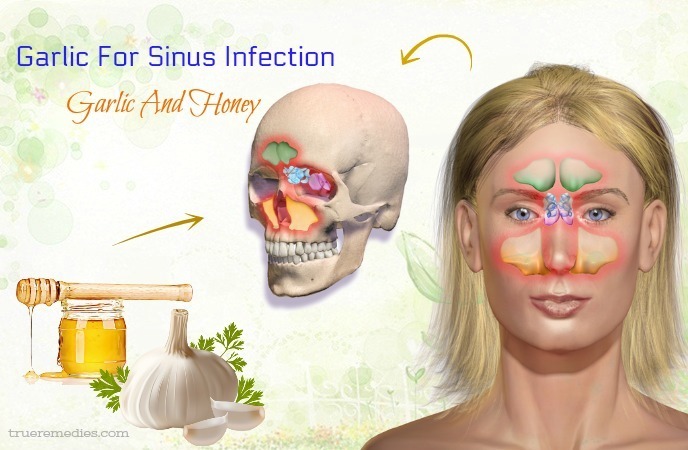 However, before that, you need to gather some basics about sinus infection and garlic’s benefits and uses. Check out on TrueRemedies.com! Medically known as rhinosinusitis, a sinus infecrion happens when the nasal cavities become swollen, infected and inflamed. Healthy sinuses are filled with air, yet when they turn into blocked and filled with fluid, the germs will develop and lead to an infection. Some conditions causing sinus blockage are the common cold, small growths in the nose lining named nasal polyps, allergic rhinitis, and a deviated septum. Acute sinusitis often starts with symptoms similar to that of the cold, including stuffy, runny nose and facial pain. Acute case of a sinus infection often starts suddenly and lasts from 4 to 12 weeks. Subacute sinus inflammation often lasts from 4 to 12 weeks. Chronic sinusitis comes with the chronic inflammation symptom, lasting from 12 weeks to longer. Recurrent cases of sinusitis occur a few times per year. Is a sinus infection contagious? It may depend on the cause in the first place. In case a virus causes your sinusitis, then you may spread that virus. It means that the individual catching your virus (sickness) will likely get a cold, possibly turning into a sinus infection or still staying a cold . However, if you have a sinus infection which is virus based, then you may have a few contagious days prior to actually getting sinus infection. Because bacteria also cause sinusitis, your infection could not be spread to others. Nonetheless, a bacterial sinus infection is more intense and lasts rather longer than a viral type. What Are Signs And Symptoms Of A Sinus Infection? Importantly, it is worth noting that these symptoms could happen with the common cold. When these symptoms keep happening for more than 10 days, you probably get a sinus infection. Those people having two or more symptoms above, or have green or yellow, thick nasal discharge, then it might be acute sinusitis . It is said that any health issue blocking off the discharge channels of your sinuses could result in a sinus infection, including respiratory infections, hay fever, and exposure to allergens like dry air and pollutants, non-allergic rhinitis, obstructions in the sinus or nasal cavities, air pressure changes, infections caused by dental issues, physical injury to sinuses, viruses, bacteria, and fungi. The most common bacteria causing a sinus infection are Haemophilus influenzae, Streptococcus pneumoniae, Moraxella catarrhalis, Streptococcus pyogenes, and Staphylococcus aureus. Considered as one of the best antibiotics in the nature, garlic is really a great solution for a sinus infection. Because colds usually result in a sinus infection, using garlic will not only naturally treat a sinus infection, but also prevent it at the beginning. It was shown that people who took either a placebo or garlic supplements for 12 weeks during the cold season from November to February were less likely to suffer from a cold. In case they got a cold, they seemed to recover faster than a placebo group. For those in placebo group (did not take garlic), they had a greater risk of contracting more than one cold over the period of 12-week treatment. In addition, garlic also has the ability to prevent the common cold virus thanks to its biologically active component named allicin. Garlic has potent anti-viral, antibacterial and anti-fungal properties, helping fight off bacterial infection that causes the problem. Not to mention allicin, scordinin is another component responsible for such beneficial properties of garlic. Garlic also has expectorant and decongestant properties that unclog sinus cavities while providing you with a relief from the congestion and pressure. Other components like vitamin C, selenium, some enzymes, sulphur, etc. 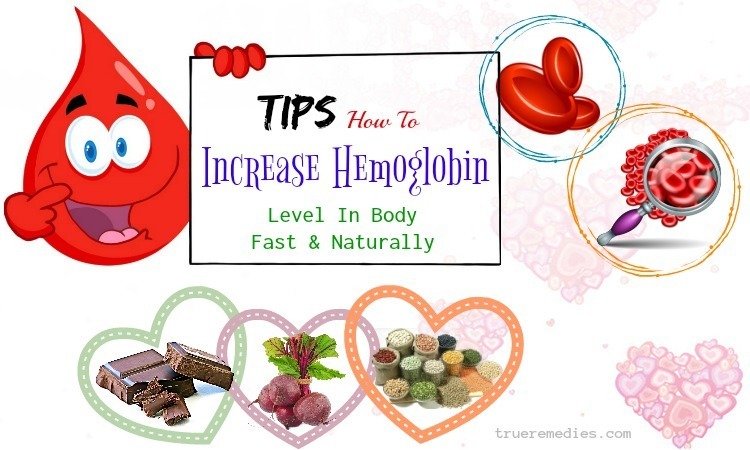 also improve the immunity to combat infections causing bacteria . Its anti-inflammatory effects can also help relieve you from pain and swelling associated with a sinus infection. To make use of garlic for general health improvement for adults, the WHO recommends taking 2-5 grams (approximately a clove) of fresh garlic, 2-5 mg of garlic oil, 0.4-0.12 grams of dried garlic powder and 300-1000 mg of garlic extract, or other forms of garlic’s extraction that are similar to 2-5 mg of allicin  . This method can provide a relief from the infection along with other discomforts accompanied by sinus infection. Steaming allows garlic’s benefits to teach sinus cavities. Inhale the steam and exhale. Avoid getting too close to hot water to avoid burns. Do this method before hitting the hay to have good sleep. Because of antibacterial and antiseptic properties of turmeric, this amazing spice gives a relief from discomforts of sinus infections. Many people notice a complete relief within 3 days if they have gotten a sinus infection for weeks. Tomato is high in vitamin A and possesses anti-inflammatory properties. So, it can repair the mucus membranes in sinus cavities. Honey has decongestant and antimicrobial properties, ensuring a relief from sinus infection symptoms, including nose congestion. You can also mix olive oil with these two ingredients to get extra benefits for sinus infection relief. 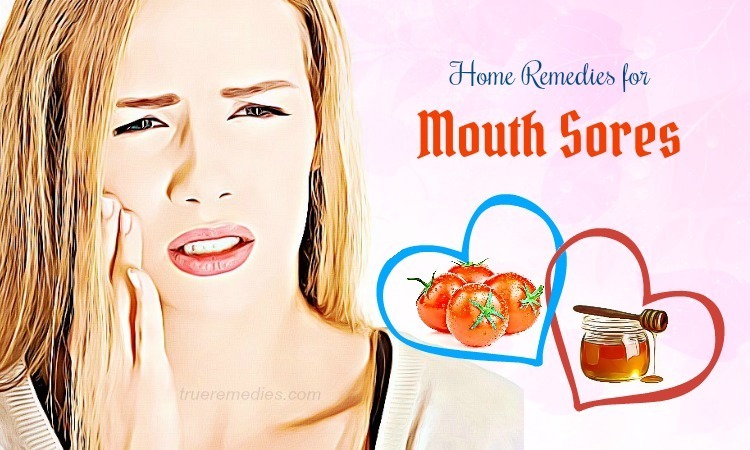 This method acts as a natural decongestant for unclogging sinus cavities and thinning down mucus membranes. Therefore, it helps you breath easily. To prevent the infection from spreading and alleviate postnasal drip, you can mix sea salt, olive oil and garlic for sinus infection removal. Garlic when infused in water will relieve stuffy nose, headache and other symptoms of sinus infection. Garlic oil also possesses the benefits of garlic in normal form. You can make use the oil of garlic for sinus infection relief at home. In regard to using garlic for sinus infection treatment, you can make use of this spice in the form of rinse to help reduce inflammation, thin down mucus membranes and clear the congestion . Apple cider vinegar has a wide range of nutrients, including vitamin A, B1, B2 E, calcium and magnesium. These nutrients can clear sinus cavities and cure allergy symptoms effectively. Furthermore, apple cider vinegar also thins mucus membranes almost instantly. 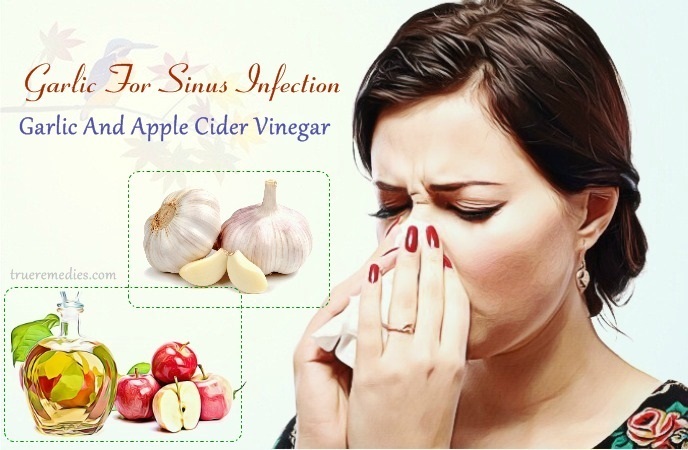 After drinking apple cider vinegar, the first thing you notice is that your mucus’ color goes from thick to thin, from white or green to clear. This is a key to kick off a sinus infection. If you are a fan of dip recipes, then this is what you can try to relieve sinus infection by using garlic. Not only adults, but children are also probably the victims of sinus infection, in spite of lower risks. 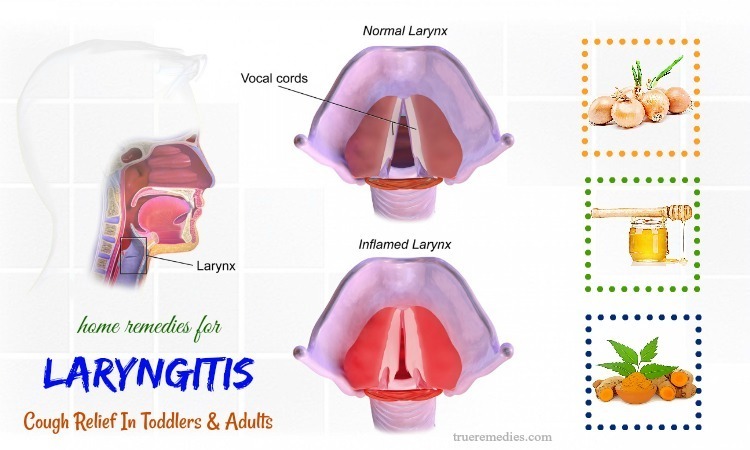 Some symptoms of sinus infection in children are headache, trouble breathing, pain around eyes, cold and cough. When not treated, it could lead to a number of health issues. Avoid letting your children get to close to the hot water to prevent any possible burns or discomforts. Do not put pressure whilst inhaling because it may lead to damage to nasal passages. You need to consult your doctor before using garlic for sinus infection in children to prevent any discomforts. Add garlic to your daily diet to boost mucus flow in the nasal passage, thereby giving a relief from sinusitis. Those people allergic to garlic should not use this spice, try another ingredient such as apple cider vinegar. Do not consume too much garlic to avoid side effects, such as bad breath, burning sensation, skin rash, allergies, breathing issues, intestinal or stomach problems, and so on. Do not take caffeinated drink to avoid dehydration, which is one of factor triggering sinus infections. Consult your doctor before using garlic for sinus infection if you are using blood thinning medications or any other type of drugs. Avoid dairy products to not worsen mucus secretion. Relax properly to get faster recovery. After reading this article, hope that you have gotten some necessary information to handle sinus infections by using garlic. If you have any concerns about this topic, the write to us in the comment box below. We appreciate your contribution and will reply as soon as possible. 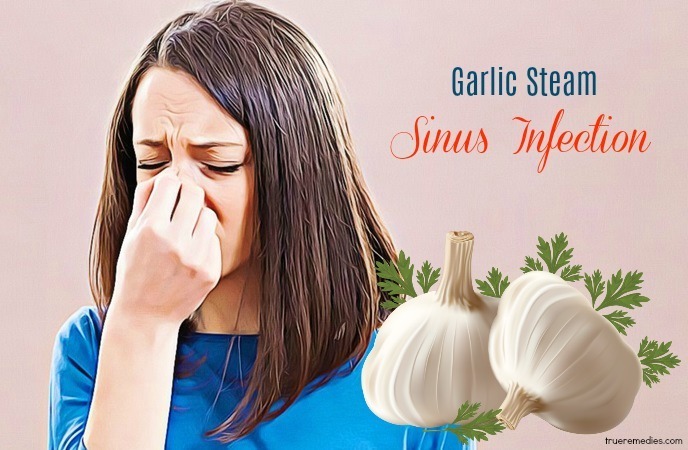 Also, do not forget to share your experiences of using garlic for sinus infection because it can help other people with sinusitis. 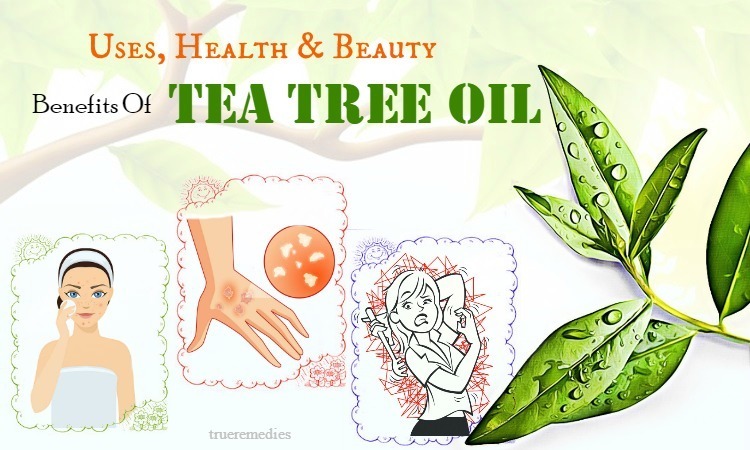 For further information about health and beauty tips, do not hesitate to visit our DIY Recipes category.